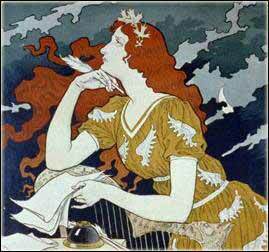 Young Woman Writing a Letter (detail), from a poster for Encre Marquet by Eugene Grasset, 1892. Image courtesy Library of Congress, Prints and Photographs Division. Well, by not spending time writing blog posts, obviously. The manuscript must go to the publisher (for editing) in about week, so the last little while has been just a teensy bit frantic. tidied up and made consistent all the footnotes (now endnotes) and the bibliography. ‘Quarrels’ chapter – fix it. ending, add EM’s comments about collecting sea shells at Bude and her comments re memories of Bridgerule. Then all I need do is step back and look at the manuscript as a whole and completely revise and … who am I kidding? As a long time promoter of the saying that finished is better than perfect, perhaps I should start practicing what I preach. And I don’t quite have the chutzpah to imagine that I’ll ever achieve ‘perfect’ anyway, so best get the jolly thing off the editor to see what she thinks of it all. Thanks for taking the time to update us! Useful information for me on images too. Best wishes for the finishing touches. That’s great, not only to be finished but to be finished before deadline. Hope editors don’t give you to much to do (though have read that editors are neither as interfering nor as helpful as they used to be). Will start reading John’s biog asap to be ready to review your Elizabeth. Err, that whizzing noise you heard was the sound of my deadline rushing by at the end of April. But my editor was totally fine with giving me a couple of extra weeks. Seems I’m not the first author to run a little late – who’d have thought? MH Ellis’ biography of John is in fact a hagiography. It’s long and dense, but kind of fun if you read it with a dubious air. Michael Duffy’s Man of Honour is shorter and easier. Well done! You’re so nearly there. I had the same experience with the photographs in ‘Georgiana Molloy. I’d paid for all the permissions where necessary for the self-published edition and made an assumption that my publisher would just take over on all that with the new edition. I saw right away, in the contract, that it would be my job once again – so I had to go back to all the contacts and request new permissions for the new book, not ‘self-published’. Actually, everyone was very kind and helpful and didn’t raise the fee any more than they had to given the change of circumstances. I decided to include one image that was the most expensive at $150, because it was an important one. But it is a tortuous road, trying to work out exactly who has copyright in the first place and getting in touch with the right person through the mists of time. And possibly hidden costs in the budget for someone setting out on this for the first time. So, well done, again! Phew. Thanks Bernice, and you’re obviously very brave to tackle the whole images thing twice! I suspect it’s something very few emerging authors are aware of. I love the meaningless statistics. More end notes than pages. You’ve gotta love history writing! Thanks Ingrid. Confession: after I counted the endnotes I sort of wished I hadn’t! Your insights on photographs is really useful knowledge to store away for future reference. Sounds like you have been doing a LOT of research. I’m thinking about writing a post about sourcing images. But I’m still sourcing images and still learning new things about how tricky it is! Might have to wait until I’m done.